The plaque can be viewed at the Ames plant, on Ophir Rd., just outside of the village of Ophir, Colorado, U.S.A. The gold mining industry at Telluride, Colorado was to be shut down due to the depletion of cheap steam power. All timber in the area had been cut for fuel and mining timbers. DC electric power and other forms of power transmission had proven to be ineffective for the 4.2 kilometer distance of transmission. AC power was judged to be the only workable solution to the economic problems of the mining industry. The Ames Hydroelectric Plant was being built during the fight between Westinghouse and Edison as to the use of AC or DC electric power. In the Summer of 1890 a generator and a motor were received from the Westinghouse Company and installed that Winter. The generator, for the power plant, and the motor for the mill, were identical single-phase alternators of 100 horsepower operated at 3,000 volts, 133 cycles per second - the largest manufactured at the time. The separately-excited generator was housed in a rough cabin near where Ames Station now stands and was belt-connected to a six-foot Pelton water wheel under a 320-foot head. The switchboard was made of a shellacked pine sheathing. Voltmeters and ammeters of both the solenoid and gravity balance types were used and were mounted in black walnut cases with window-glass fronts. 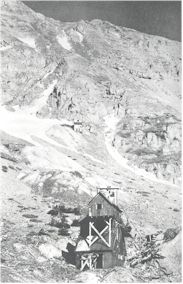 The transmission line was three miles long from the valley floor to the mine above the timberline. It was constructed of Western Union cross-arms with insulators carrying two no. 3 bare copper wires. The cost of the wire was about US$700, being only one percent of the cost estimated for a direct-current line. The plant, in operation continuously, required fifteen to twenty attendants. The Ames installation was the first to generate alternating current electric power for industrial application. The entire output of the plant was used for mining.